Our family makes a regular practice of having daily quiet time for the girls. I have them both sit on blankets with toys and books (or coloring books and crayons for Julia) for about 30 minutes. Over the last several months I feel like I’ve hit a quiet time rut. It seems like we are always giving Julia the same books or the same toys and her interest is fading fast. I read a great idea nearly a year ago on Keeper of the Home about having quiet time bins. 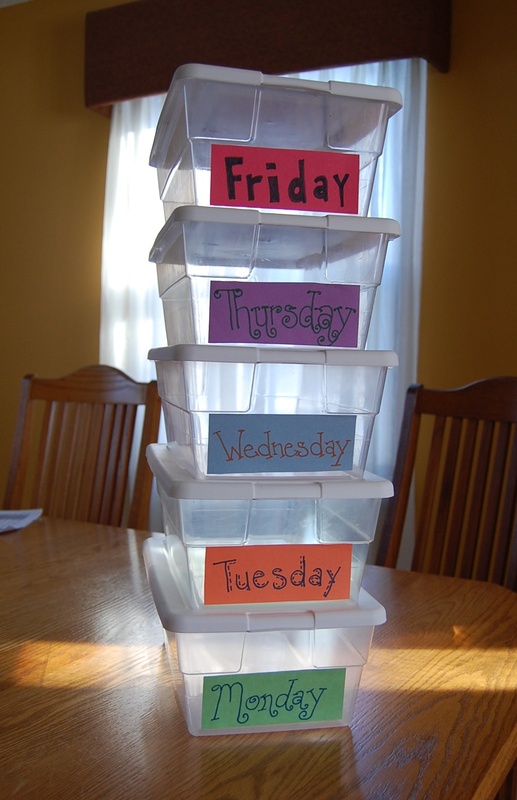 The idea is to have bins for each day of the week, containing something new for each of the days. The child only plays with those items/toys on that day. I’ve been wanting to put this into practice since first learning about it, but haven’t wanted to splurge on nice bins. That is until now. I am still working on filling them with great things I know Julia will enjoy each day. She’s thrilled about her “boxes” and was more than excited when she got to open it for quiet time yesterday. Just to add some cheesiness… I have these little 16 oz containers inside each bin for Hannah. The containers hold one or two small books each. I did this 1) because I thought it was kinda adorable 2) to help Julia later understand that the contents of the bins are to be shared with her sister. When Julia did her quiet time, I pulled out the small containers for Hannah. Not surprising, Hannah liked the box more than the books or other toys she had! 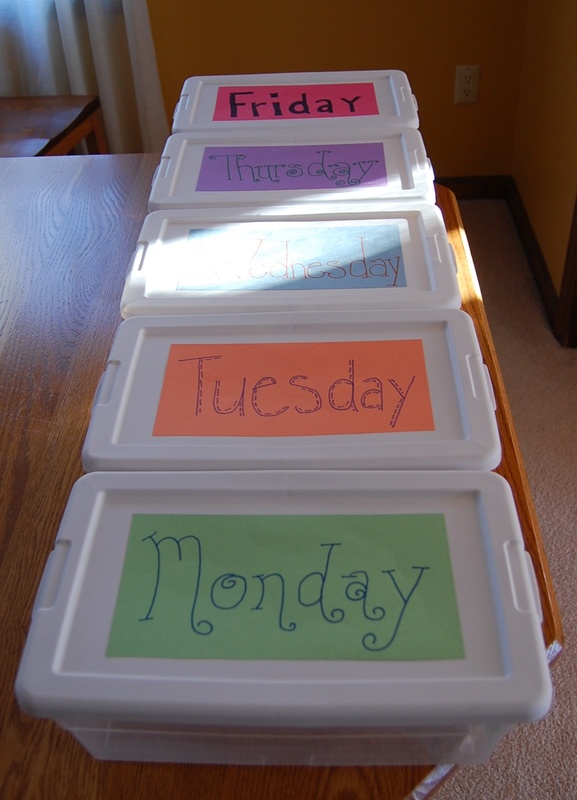 12 Responses to "How to make activity bins for your kids"
Love the idea of quiet time. I’m assuming this is in addition to napping? Is this also when you have your own quiet time? The boxes came out lovely, glad Julia enjoys them! I have frequented the blog for about a year and am now 21 weeks pregnant and love your ideas (original or passed along : ) for stay at home moms! Ooh- I like it. This sounds like something off Org Junkie. I do love me some structure. Katie – CONGRATULATIONS!! That is great news. Do you know if you’re having a boy or girl? Send me an email sometime if you get the chance, I’d love to hear all about how things are going. And I’m super glad you’ve enjoyed my blog! Sarah-Thanks, would love too, where can I find your email addy? I bet a moving baby would make quiet time a tad more difficult. P.S. Katie – yes, this is in addition to naptime. And if I haven’t gotten a quiet time for the day, then I do it during this time too. However, it’s gotten a little more tricking, since Hannah is requiring more “help” staying on her QT blanket. But, ideally, when things go smoothly, I get about 20 minutes of QT while I help the girls do about 30 minutes. Really like this idea. I might do this for their regular toys as well. We keep having so much mess to clean up! I LOVE this idea and I don’t even have kids. It makes me long for my elementary education roots…or babies. Bravo Mommy and I look forward to passing this along. Thank you! I love the ideas. I think I will try clean yogut containers first. My kids are at the stage of needing help with everything. I made a quiet book, that engrosses them for about 15 minutes. That’s a start, right.